We come today to the final part of the Sermon on the Plain. This is Jesus’ conclusion to his own sermon. 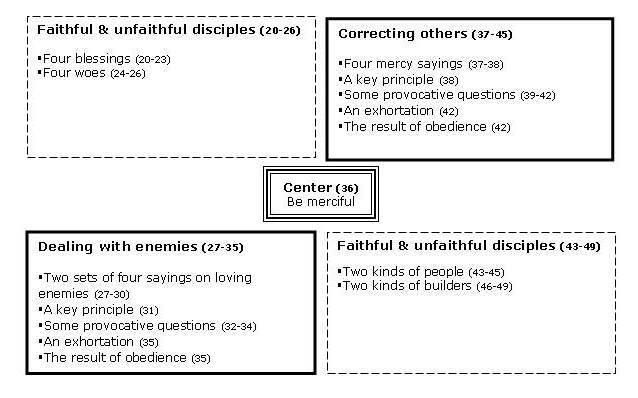 As we saw last week, the second section on loving enemies corresponds to the third section on correcting others. They have a common theme – mercy, and a common structure, with v. 36 in the middle holding them together. Today I would highlight that the first section on blessings and woes corresponds to the fourth section, our focus. They have a similar structure and they share a common theme. Both are about a comparison between faithful and unfaithful disciples. In the first section on blessings and woes we learned that we are to be faithful despite the consequences. Even if it makes us poor, hungry, sorrowful and causes us to be slandered. In the second section on enemies, we learned that we are to love our enemies and return good for evil. In the third section on correcting others, we learned that when we see sin in someone’s life, we are to act with mercy, not judgment or condemnation, so that we can help them get rid of their sin. So this last section is Jesus’ call to faithfulness for each one of us. In this he challenges us to test two things in our lives. Do our words line up with Jesus’ teaching here? Let me point out two things here. 1. The principle of the inner and the outer. This teaches us that what’s in your heart, the treasure, what’s stored up in it, the abundance – that’s what comes out. Jesus says, “Each tree is known by its own fruit” – v. 44. So you can see what is in a person’s heart by how they act. (Now someone can put on a show for a while, but eventually the truth comes out.) There is an unbreakable connection between the inner life of a person and the outer life of a person. The inner is the source of the outer and the outer is a window into the otherwise hidden recesses of the inner. According to Jesus, a good tree produces good fruit. 2. The focus here in on our words. Jesus pulls vs. 43-45 together by saying “For out of the abundance of the heart his mouth speaks.” So in this case, it is our words that reveal what is in our heart. be faithful despite the consequences? give mercy to those who fail and sin? If we do this shows that we are a good tree. We have stored up Jesus’ teaching in our hearts. And so we have a good treasure, which overflows in words that are shaped by Jesus’ teaching. In other words, we show that we are faithful disciples in this area. Now this same test can be applied to others who come to us and teach. Do their words affirm and teach all that Jesus says in this sermon? When you hear someone preach or teach, or on the TV or the radio – test their words and see. Do our actions line up with Jesus’ teaching here? Do we obey Jesus’ teaching? Section one: If we suffer for our faithfulness to Jesus we will be lifted up and blessed in the kingdom of God and not cursed. Section two: If we love our enemies we are “sons” and thus inheritors of the Father’s kingdom; not sinners who have no reward. Section three: If we give mercy to those who fail, we will receive mercy and not judgment or condemnation on the last day. There is a focus on entering the future kingdom of God in each of these. Well, in calling us to faithfulness at the end of his message, here in vs. 46-49, Jesus draws this all together and makes the point that our actions based on this sermon as a whole will determine our eternal fate. Jesus’ question is rooted in a contradiction. To call Jesus ‘Lord’ means you are to submit and obey. As Jesus says in 6:40, disciples are supposed to learn from and obey their teachers. But some who call Jesus ‘Lord’ do not submit and obey. This was true in Jesus’ day and it remains true today. And it just doesn’t make any sense! We say one thing and do another. We indicate that we will listen to Jesus and obey him, but we listen to and obey other voices – while we ignore Jesus. In vs. 47-49 Jesus gives the parable of the two builders. This compares those who call Jesus Lord and obey him, and those who just call Jesus Lord and don’t obey him. It gives us a picture of the final judgment. And it’s a warning to us. One house was well built. The builder worked hard and dug deep to lay his foundation on something solid. The second house was not well built. It had no foundation. Then a storm comes with lots of rain and deep waters. Storms and floods often picture God’s judgment in Scripture (Psalm 18:11-14; Habakkuk 3:3-15; Zephaniah 1:15/ Genesis 6-9; Isaiah 28:2, 17; Ezekiel 13:10-16). After the rivers were swollen with rain the flood “broke against” both houses. The first house survives the storm. Because it had been well built it “could not be shaken.” It was built on solid rock. The point is that disciples who only call Jesus Lord, but do not obey him, will be washed away in the storm of the final judgment. This is the second house. Only disciples who act on Jesus’ words, who obey him, will survive the storm of the final day. This is the first house. Are you faithful despite the consequences? Do you give mercy to those who fail? If we live out this teaching, then we show ourselves to be faithful disciples. Since we have dug deep and built on the foundation of Jesus’ teaching, we will not be shaken. To sum it up, Jesus calls us to faithfulness in two ways. Do our words line up with his teaching here? And – Do our actions line up with his teaching here? We need to test ourselves in these ways so that we can grow more and more in our faithfulness to our Lord. Last week we began our series on the Sermon on the Plain, the name for Jesus’ teaching in Luke 6. We looked at the first part of it – the blessings and the woes. In these, Jesus, speaking to his disciples, comforts the afflicted – by giving four blessings to the faithful, and he afflicts the comfortable – by giving four woes to the unfaithful. Or am I with the ones who have compromised their commitment to Jesus in order to gain the world’s favor and will be judged? Today we move to the second section – focused on dealing with enemies – 6:27-36. All of these commands call us to love our enemies. But there are differences between the first four commands and the second four. I want to take just a few moments to flesh this out, because it has a big impact on how you put this into practice in real life. The first four commands instruct us to return good for evil. We respond with love even when someone harms us. The second four instruct us to yield to the enemy. We are to give what is demanded, and more. Let’s take this example – You are being robbed . . ..
1. Under the admonition of the first set of commands you must simply love the robber, do good in return, and pray for him. As long as you return good for evil, you have a great deal of freedom to choose different options. You could refuse to give up anything, you could try to stop or disarm the robber. Or you could call the police, if your goal isn’t just to punish him. As long as you also show love to him, and act with his best interests in mind, not just yours, you’re fine. 2. But under the admonition of the second set of commands you must yield to the robber, give whatever is demanded and more, and never ask for anything back. Do you see the difference? You can’t apply both sets of instructions to this case at the same time, because they give different answers. What does this tell us about these two sets of commands? It tells us that they are speaking to different situations. In Scripture the command to yield (from the second set) is given in relation to authorities, for instance the government. And we are taught to submit even if they are an enemy to us (1 Peter 2:18-23; Romans 13). An authority figure who slaps to put someone under them in their place. This was a common custom of the day. It’s not a fist fight, it’s a way of pulling rank. A creditor who takes the coat given in pledge for a loan by court authority. It’s not someone just stealing your coat. There is a legal procedure taking place. The last two sayings picture the requisitioning demands of an occupying government, as the Romans did in Jesus’ day. For instance a soldier could come and say, “Your horse is needed by the Emperor” – and take it. When it says in v. 30 – “give to everyone who demands from you,” it’s talking about this, not, for instance, a beggar on the street. (The word “ask,” sometimes translated as “beg” is best translated as “demand” in this context, since you really don’t have a choice.) Also, when it says, “and from one who takes away your goods do not demand them back,” it’s talking about this, not ordinary theft. Often items were not given back, even though they were supposed to be given back. So the second set of commands deals with enemies who are authorities. And we are to yield to them. This is, in my understanding, what biblical nonresistance means. It’s the combination of the command to submit to authorities and to love our enemies. When you put these two together, you get nonresistance. Now yielding doesn’t exclude other options, for instance fleeing (Matthew 10:23) or appealing to a higher authority for relief (Acts 25:10ff) or standing your ground and taking the consequences. But since Jesus doesn’t talk about these here, I won’t go into them for now. The first set of commands deals with regular enemies – your neighbors, evildoers, robbers. And we are to love them and return good for evil. My aim is that next week we will get into some of the practical realities of loving enemies. But my goal today is simply to help us understand what Jesus’ instructions mean here. v. 31 – “And as you wish that others would do to you, do so to them.” This is the so-called golden rule, which tells us how to act toward others. The usual standard that people employ is – how has so and so treated me? And then you respond accordingly. If John does good to me, I’ll do good to him. But if he wrongs me, I’ll get him. If you put this into a principle it would be the opposite of the golden rule – As others have done to you, do so to them. This is the standard of “an eye for an eye” or to put it positively, “a favor for a favor.” You act towards others based on how they have acted toward you. But Jesus gives us a different, higher standard. To say it in a slightly different way – treat others based on how you want to be treated. The idea here is that, just as you want what is good, so give what is good to others. Let this be your standard. This is the principle behind all eight statements in the first section we looked at. They set aside an eye for an eye and work according to the logic of giving what you want to get. This principle teaches us to love and do good to all, even if they don’t deserve it. In vs. 32-34 Jesus asks three questions that show that the “eye for an eye” standard is not an adequate one. Jesus is saying, everybody loves and does good to those who love and do good to them. This is just an expression of the standard of an eye for an eye, or a favor for a favor. You don’t get any credit or reward for this. Even sinners do this. The term “sinner” is used to speak of people who are acknowledged to have failed to live according to God’s will. Jesus’ point is that if this is the best you can do, you’re doing nothing more than what sinners do. His challenge is, do you live by a higher standard of conduct than sinners? – to live according to the higher standard that Jesus is teaching. v. 35 – “But love your enemies, and do good, and lend, expecting nothing in return . . ..” Put aside an eye for an eye or a favor for a favor, and simply love and do good to all, no matter how they treat you. A concrete example here is loaning money to an enemy who is in need (if you can). Jesus indicates that if they are unable to pay it back, we are to forgive the loan. Love and do good to all, no matter how they treat you. To be a son of God is not about gender, it is about a certain social or religious status. It is to be an inheritor of your Father’s blessings. And both women and men can act like the Father and thus show that they have the status of inheritors. But the specific test here is – Do we love our enemies, like our Father does? If we do, we will inherit the blessings of the kingdom. We end with v. 36, which is the center point of the whole Sermon on the Plain, and sums up this teaching on loving enemies. “Be merciful, even as your Father is merciful.” Again, like Father, like son. The Father is merciful to evildoers. And as his children, we are to be merciful as well.